1. He is a hard worker, willing to do whatever he has to do to provide for our family. 2. He values my contributions at home and doesn't think I'm "JUST" a stay at home mom. He gladly tells people I stay at home with the kids and explains how it works for us. 3. He is so easy-going when I want to try something new, like join a group, even if he suspects that it might not work out for me. He doesn't rub it in my face if it doesn't work out, just encourages me to learn. 4. He has always been supportive of me wanting to homeschool our kids. 5. 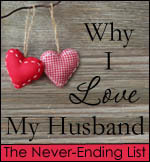 We've had fights, arguments, and both said things we regret...but he has always had the mind frame of being in this for the long haul - divorce is not an option. Love that last one! A famous actor when talking about his success always says, "I have no plan B. It distracts from plan A." I've always loved that. Thanks for linking up! I love posts like this that are uplifting and thoughtful!